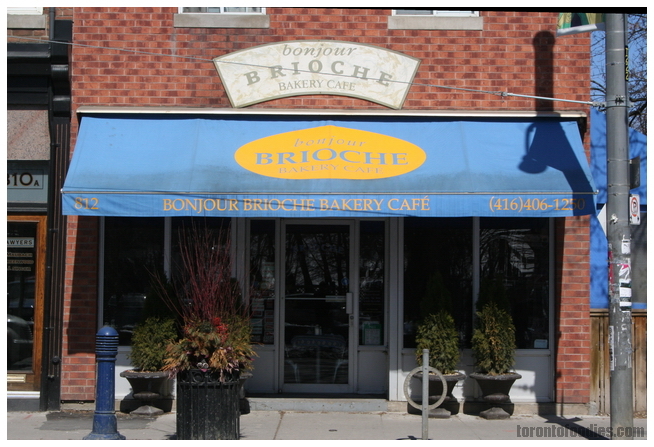 I think I first heard about Bonjour Brioche from a BlogTO article on the best french bread in town, last summer. Located at Degrassi and Queen East, it’s just east of the DVP. All three times I’ve gone around noon, there’s been a 2-3 table wait, but it’s a very worthwhile wait. The seating space is sparse, though during the summer, patio seating is available. 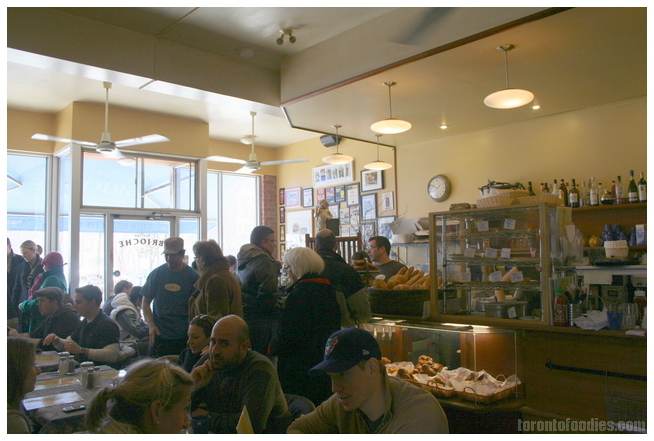 Baking racks line the kitchen, while the display case taunts you with croissants and bageutte sandwiches. 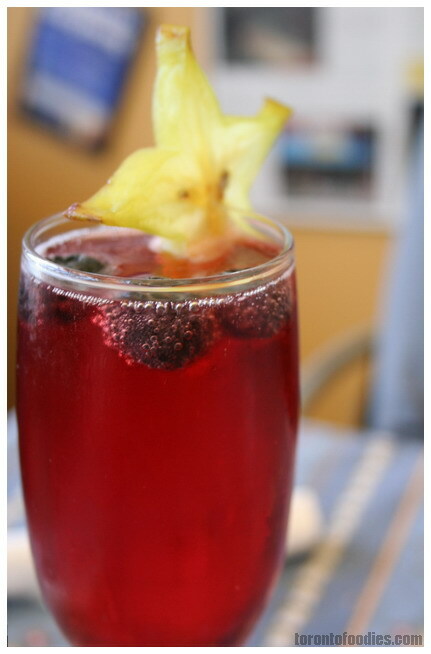 We were interested by the Pomegranate Mimosa on the daily special menu. While the presentation is attractive, the flavour was what you might expect; pomegranate juice is very mild, and was a weak pairing for the champagne. The bageutte sandwiches ($6~$7) are absolutely delicious. On a slab of daily-baked crusty baguette, these brought back memories of Paris, though not quite as narrow. 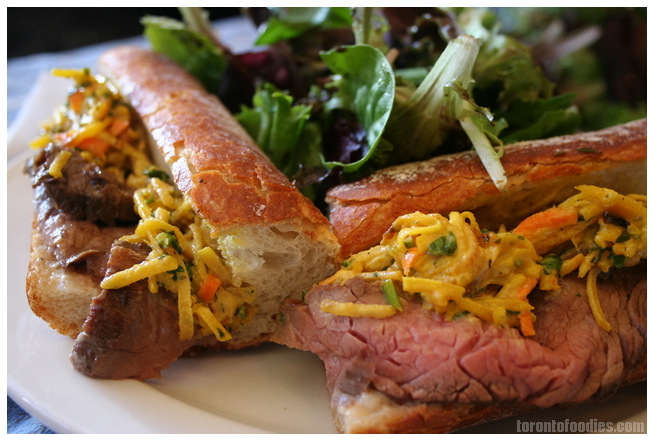 Today’s special was roast beef with roasted yellow beet. It’s topped with delicious garlic aoili and a touch of horseradish, the roast beef perfectly pink. 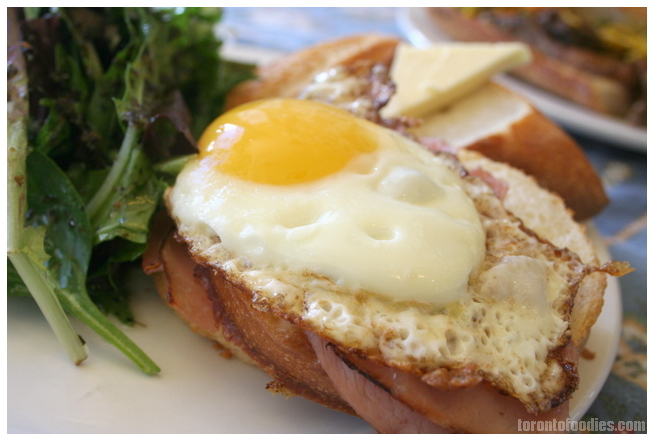 The Croque Madame ($8.75), brioche layered with ham & gruyere topped with an egg, is a must-have. It’s served with a side of mixed greens with Bonjour Brioche’s signature house balsamic basil vinaigrette, and a healthy slab of baguette bread. The basil adds a flavourful complex twist to an otherwise solidly sweet-tart-balanced vinaigrette. While visually playing second fiddle, the brioche bread is the star of every bite — eggy, light, and fluffy, yet holds its own against the ham and cheese. The egg was nicely runny, soaking nicely into the brioche. 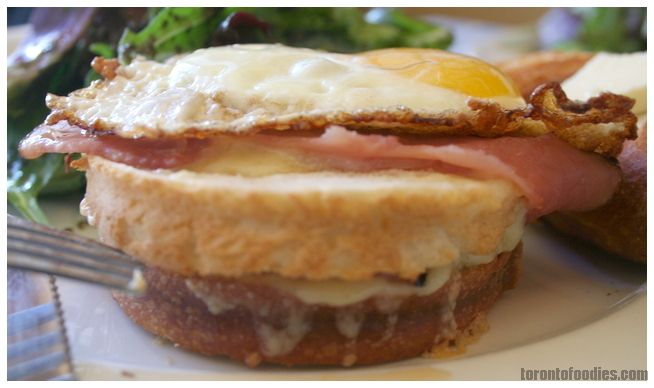 I’ve yet to try the brioche on its own, but I’m not sure I can resist getting the whole Croque madame.